“Forehand Takes The Middle” Myth Busted! Does forehand really take the middle? Across pickleball courts nationwide the prevailing rule of thumb for the middle ball is that the forehand takes it. The reasoning offered is that usually, both players have a stronger forehand than backhand. And typically, with two players of comparable skill, of the two strokes in the middle, the forehand will be the stronger shot. Therefore, the player with their forehand in the middle can handle that middle ball better, and also possibly do more damage with it than the player using their backhand in the middle. On it’s face and in the most simplistic of ways to think about it…it very well may be the right answer if all the conditions for it to be the right answer are met. But what if those conditions aren’t met? What if the backhand is stronger? What if you are deploying “forehand take the middle” strategy and it’s not working? What if one player is clearly better than the other, on both sides? What if the player’s forehand is off that day? …and not concerned enough with where to be on the court, where our partner is, where the opponents are and what to do in order to maximize how we work the court strategically. Both on our side with proper court positioning and the opponents side with proper target selection. 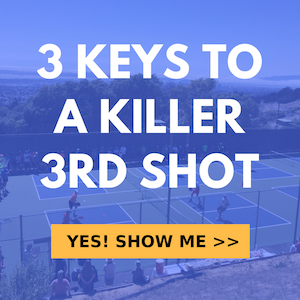 Winning pickleball is less about forehands and backhand and more about where to hit and why so that you are constantly maintaining the strategic advantage on the court. Helle Sparre, a top senior pro player knows this on a deep level. Among many other titles, she is a US Open and National Champion. In the video above, Helle busts the myth of forehand take the middle and explains what to do instead.